The Pale Harvestmen; the Scythes of Nurgle; the Eyes of Mortarion. The elite warriors of the Deathshroud go by many names, and every one is redolent with a miasma of fear and menace. Swollen with unnatural power, the Deathshroud tower over their enemies. Rusted gauntlets and squirming tentacles clutch huge battle scythes known as manreapers, cursed weapons that slice heads from shoulders and limbs from torsos with every swing. Clouds of plague flies boil around the Deathshroud, while vile smog spills from vents in their armour to choke and blind their foes. 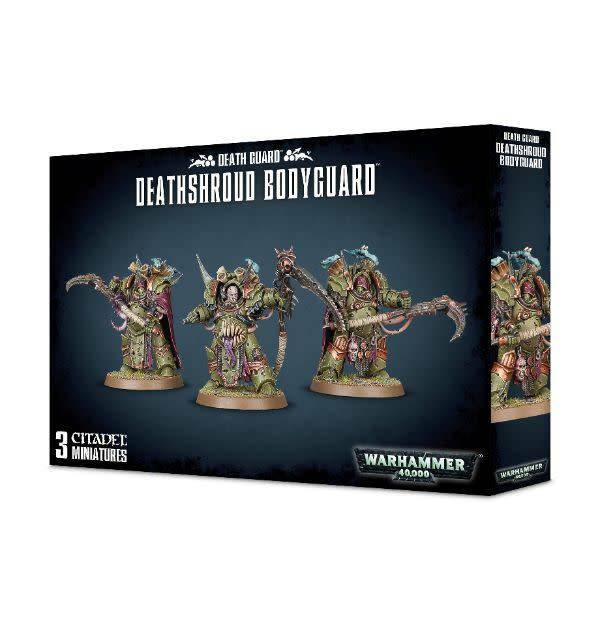 This multi-part plastic kit contains the components necessary to assemble a set of 3 Deathshroud Bodyguard. Impressively large and dense, covered in rot, decay, tentacles and horror, these models exemplify the corrupting gift that Nurgle imparts. Each is armed with a manreaper – a large scythe, pitted and pockmarked with rust and disease, it stands even taller than the Deathshroud who brandish it – and a plaguespurter gauntlet, used to squirt unpleasant maladies at the unfortunate. Each of the three is bedecked with Nurgle symbolism, found in the rust, boils and chips in their armour, through which vile tentacled and bloated flesh poke, barely covered by ragged cloaks. there are 7 variant heads included, a mix of helmeted and bare, and an extra plaguespurter gauntlet – this is for an optional unit Champion, who has the option of wielding two of these. The Deathshroud Bodyguard come as 51 components, and are supplied with 3 Citadel 40mm Round bases.